Instructions: Prepare a card base 5 x 7", layer a piece of the Buttons and Blooms paper 1/4 inch smaller on top. Cut 4 of the corner pieces out of blue cardstock using the Album Tags and Accents die, adhere one in each corner. Stamp the pocket on blue cardstock with the Manganese ink, cover with clear embossing powder, heat set, cut out with the coordinating die. Stamp the sentiment in the middle of the pocket, heat set it the same way. Add foam dots to the back and adhere to card. 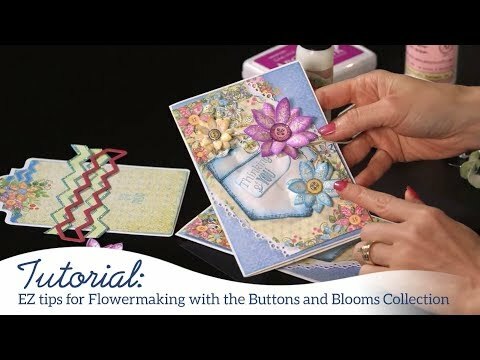 Stamp the flowers and buttons on the colored cardstock, heat set, and cut out with coordinating dies, shape using the Deluxe Flower Shaping kit. 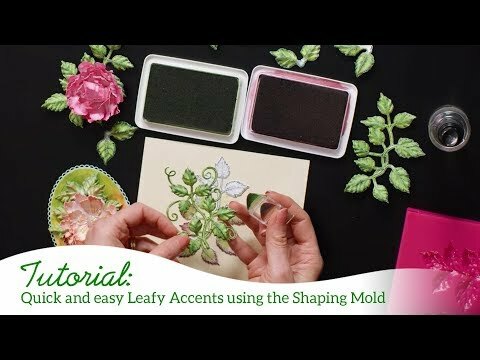 Stamp the leaves on Green cardstock with the Library Green ink, cut out with coordinating die, shape using the mold and adhere to card. Add flowers on top of the leaves. Add the buttons to the center of each flower and the pocket as shown. To finish, add the glitter to the leaves and flowers and Crystal Lacquer to the buttons.